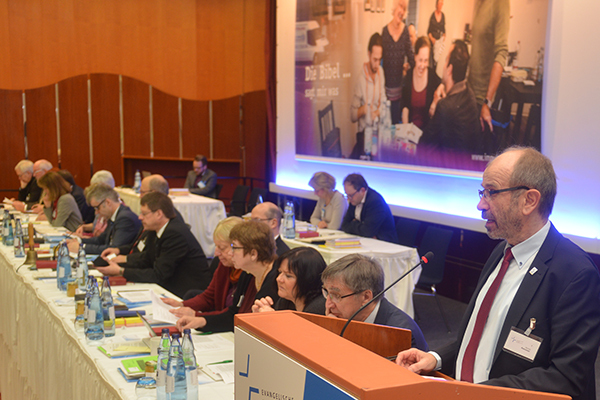 At the beginning of this election year 2017 in the Saarland, in North-Rhine Westphalia and for the Federal government, President Manfred Rekowski called on the churches to put questions of justice and a balanced society on the agenda. “As the Church, we need to contribute to the fight for freedom, for justice and for cohesion in society. It is a matter of finding appropriate and human-orientated solutions”, he said. As the senior minister of the Rhineland Church he was presenting his “Report on significant events for the Church” to the 2017 Regional Synod. Expressing his concern, the President of the Evangelical Church in the Rhineland drew attention to several statements made by political parties. “Here we find positions being represented which clearly contradict the Christian message, even though the label “Christian” is being used”, said President Rekowski, with reference to statements from the Alternative for Germany (AfD). “There is such a thing as false witness” he added. Anyone who bases their political policies on a vague “religious tradition of Christianity”, as it is formulated in the manifesto of the AfD, “will be closely questioned by us as to the foundation of their faith.” Anyone who denies a place in German society to both Judaism and Islam, will provoke massive opposition from the Evangelical Church. “Faith in the God who loves the world and the human beings in it has nothing in common with hatred towards individuals or groups. That is not an alternative for Christians but is a perversion of faith”, continued the President. At the same time President Rekowski called on his Church to make renewed efforts to confront the fact that a large proportion of the population blatantly have misgivings towards Muslims. “What does it mean for our society when 57 percent in the East and 49 percent in the West of Germany regard Islam as a threat?” was the question he posed to the Synod meeting. In the face of Islamist attacks, for example, there was a widespread but short-sighted connection being made between Islam and terrorism. But in this, people are following the precise track laid down by the terrorists. “It is a primary task of the church in our society to emphasise over and over again that the inhuman actions of a small number of criminals gives a false impression of the religion of Islam, to which more than a billion people belong and who want to live in peace.” At the same time President Rekowski called upon mosque congregations to disassociate themselves clearly and distinctly from such actions. Adopting a clear position made a great contribution to social peace. President Rekowski also made a presentation to the Regional Synod about the year of commemoration of the 500th anniversary of the Reformation. The motto chosen for the Rhineland is “I am content, redeemed, set free”, seen as being a Protestant time-check. Christians are set free in their relationship with God, but given the task of responsibility towards their neighbour. “Whoever wants to avoid that responsibility, to abandon their duty towards their neighbour, is in effect leaving the community of believers, even if they remain as church members. In this there can be no dispensation”, said President Rekowski. In his report the President also took a strong position on the importance of ecumenism. In this he made a case for “ecumenism under a single roof”. Such “shared communal living” was not dependent on reaching consensus on all aspects of doctrine, but was an attempt to look for common solutions across the denominations for social and civic issues. In addition this also mean discovering the riches of the different denominations. “Variety is not a failing, but an opportunity, all the more so when being a church that is reformed also means being a church that is ecumenical”, said President Rekowski. For local church congregations, as much as for the whole Church, this means that a prominent piece of work has a far greater impact and clearly provides a much stronger binding force. In the following discussion, the AfD was raised a number of times, among other issues. “The popularists must have their masks torn away”, said one Synod member, whilst another expressed thanks for the “resoluteness of the views expressed”. A further Synod member pleaded for the Church to assert the issue of the status of the creed (“Status Confessionis”), thus declaring the AfD position as incompatible with the Christian faith. President Rekowski, on the other hand, stressed: “I put my faith in confronting the substantive issues”. Vice President Dr Johann Weusmann, the senior lawyer of the Rhineland Church, clarified that when checking on suitability for the office of Elder, for example, any statements contrary to the Christian concept of humankind are taken into account. Vice President Christoph Pistorius, Director of the Human Resources (Personnel) department of the Regional Church Office, explained that staff who are employed in accordance with the Federal public law – which also includes church ministers – have to register their candidacy openly. The standard procedure is then to interview them “for reasons of public welfare”. The discussion will include whether opinions which may for example contradict the creed are compatible with service in the church.